Dr. Edward Thurston Hiscox (18141901) was a distinguished Baptist theologian and author whose Standard Manual for Baptist Churches (published in 1890) and New Directory for Baptist Churches (published in 1894) were considered two of the foundational works of the modern Baptist church. 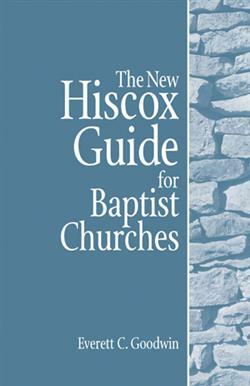 In 1964, these books were combined into the Hiscox Guide for Baptist Churches, which has become a classic work in its own right. At the end of the 20th century, the book was revised and updated by well-respected Baptist pastor and teacher Dr. Everett C. Goodwin. Following these chapters are seven appendices that include a Baptist chronology, creeds and confessions, and more.